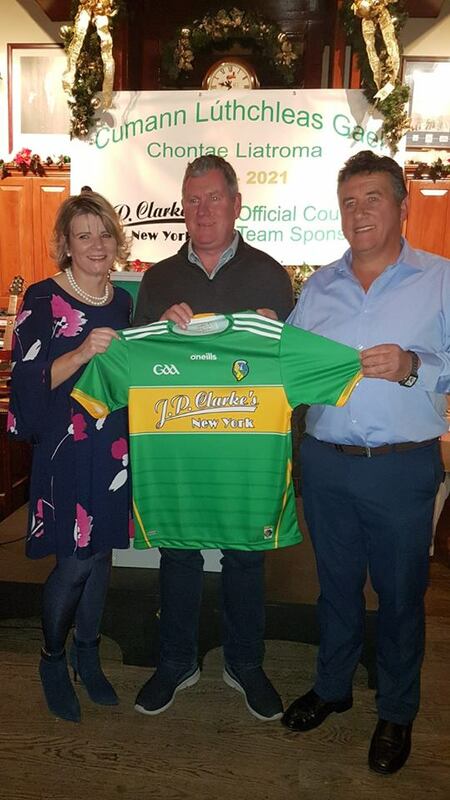 JP Clarke’s Saloon, McLean Avenue, Yonkers, New York is the main sponsor of Leitrim GAA Senior Footballers for 2019 to 2021. The sponsorship deal was announced officially on the weekend of Leitrim County Finals Day 14th October 2018. Séamus Clarke, a Gortletteragh native, and Caitríona Clarke, a Drumshanbo native, together run the hugely successful bar and food business on McLean Avenue, trading under the banner of JP Clarke’s Saloon. It is recognised as a most popular meeting for many Leitrim natives in New York and most particularly on the occasions of Leitrim/New York Connacht Championship clashes in Gaelic Park. Leitrim GAA is delighted to have JP Clarke’s Saloon as its main team sponsor over the next three years and looks forward to a great and successful partnership. Leitrim GAA wishes to thank its valued sponsors for their support during our current season. There is a range of sponsorship opportunities available, from jersey sponsors, through to competition sponsors and development squad sponsors. If you would be interested in sponsoring us please contact us.